What Happens When The Magic Jack iPhone App Arrives? 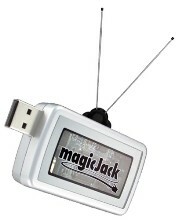 The Magic Jack as really hit the marketplace by storm with overwhelming acceptance and positive customer feedback. For the price of $39.95 for the first year, and then $19.95 each year after, people are making calls throughout the US, and the world, without paying any additional fees. The power of the Magic Jack is the VOIP interface – allowing calls to be made over via the Internet. My only question now is this – when can we expect to see the Magic Jack iPhone App? A Magic Jack iPhone App could be revolutionary for the iPhone and the Blackberry. When this type of VOIP application running on mobile devices, could we not then drop our voice plans from our current mobile phone carriers? I mean, we’d still need a data package for the iPhone, but with a Magic Jack iPhone App, who would need voice packages along with their high monthly rates? Am I missing something here, or could the Magic Jack just about make the mobile phone carriers irrelevant? And when looked at with that perspective, the Magic Jack could, very soon, become a household name! What are your thoughts about the impact of a Magic Jack iPhone and Blackberry application? Having a MagicJack application working on iPhone sounds like a great idea.